Forced: After travelling to Tower Gate, each player places the top card of his deck, face down in front of him, as if it just engaged him from the staging area. These cards are called 'Orc Guard', and act as enemies with: 1 hit point, 1 Attack, and 1 Defense. X is double the number of players in the game. While Amon Hen is the active location, players cannot play events. X is double the number of players in the game. While Amon Lhaw is the active location, treat all attachments as if their printed text boxes were blank. Forced: After traveling to The North Stair, move the top card of the encounter discard pile to the staging area. Resolve any 'when revealed' effects on that card. While Branching Paths is in the staging area, each Dark location gets +1 Threat.Forced: After Branching Paths leaves play as an explored location, look at the top 3 cards of the encounter deck. Players must choose 1 of those to reveal and add to the staging area, moving the other 2 to the bottom of the deck. 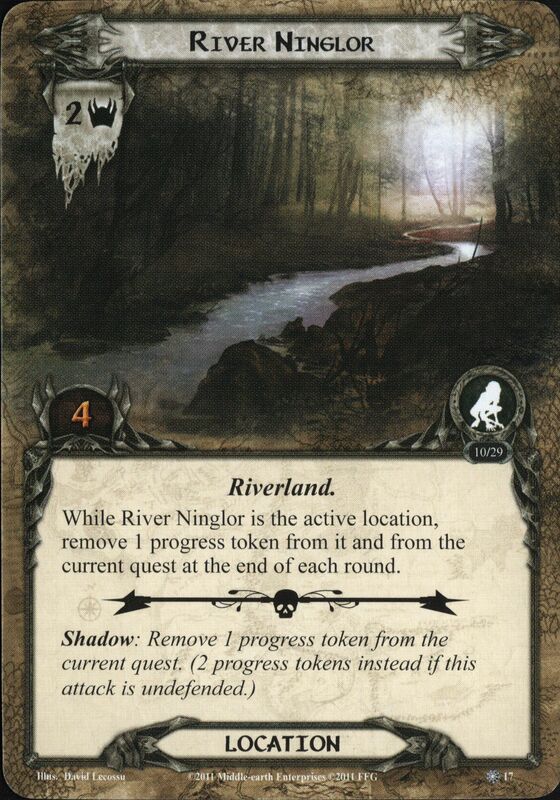 While Bridge of Khazad-dûm is the active location, players cannot play cards. When Revealed: Immediately travel to Dreadful Gap. If another location is currently active, return it to the staging area.X is the number of characters in play. Immune to card effects. Players cannot optionally engage enemies and no engagement checks are made.Forced: After East-gate leaves play as an explored location, add First Hall to the staging area. Travel: Each player must raise his threat by 3 to travel here.Forced: After First Hall leaves play as an explored location, add Bridge of Khazad-dum to the staging area. When Revealed: Each player may choose and discard 1 card at random from his hand. If all players did not discard 1 card, Fouled Well gains surge. Travel: Players must exhaust a Cave Torch to travel here. Shadow: Cancel all combat damage dealt to attacking enemy. While Turbulent Waters is the active location, players cannot optionally engage enemies. When Revealed: Search the encounter deck and discard pile for 1 copy of Mountain Warg and add it to the staging area, if able. Shuffle the encounter deck.Response: After Warg Lair leaves play as an explored location, each player draws 1 card. Action: Raise each player's threat by 1 to place 1 progress token on Zigil Mineshaft. While Caradhras is the active location, questing characters get -1 Willpower. Players cannot travel to Caradhras except by quest card effects. While Fanuidhol is the active loction, heroes must spend 1 resource from their resource pool to count their Willpower during the quest phase. Travel: Reshuffle all locations in the discard pile and victory display back into the encounter deck. If you reshuffled at least two locations, reduce each player's threat by 11 and discard all copies of Freezing Cold from play. While Barren Hills is the active location, ignore ambush. While Goblin Gate is the active location, the first enemy revealed from the encounter deck each round gains ambush. If that enemy engages a player, it makes an immediate attack (deal and resolve a shadow card). Forced: After you travel to Makeshift Passage, place 2 progress tokens on the current quest card, bypassing any active location. No more than 1 progress token can be placed on Perilous Swamp each round. Shadow: Remove 1 progress token from the current quest. Travel: The first player must exhaust 2 characters to travel here. Lost: Each player must choose and discard 1 card from his hand. Forced: Before placing progress tokens on Twisting Passage, the first player must make a locate test. If this test is failed, do not place any progress tokens on Twisting Passage and trigger all 'Lost:' effects in play. While Durin's Bane has no damage on it, progress tokens cannot be placed on Second Deep. While City Street is in the staging area, players cannot travel to a location that does not have the title City Street. Forced: Each time a location is discarded from the top of the encounter deck, raise each player's threat by 1. Shadow: Deal attacking enemy an additional shadow card for each Thug enemy in play. Immune to player card effects. Travel: Each player must spend 1 resource from one of his heroes' resource pools to travel here. Shadow: Defending player discards all resources in his heroes' resource pools. If an Orc enemy is in play, progress tokens cannot be placed on Orc War Camp while it is in the staging area. Shadow: attacking enemy gets +1 Attack for each shadow card dealt to it. While Pelargir Docks is the active location, enemies get +1 Attack and +1 Defense. If the Approach has 7 or more damage, remove it from the game (do not collect its victory points). Response: After The Approach leaves play as an explored location, remove stage 3 from the quest deck, if able. If The Banks has 3 or more damage, remove it from the game (do not collect its victory points). Response: After The Banks leaves play as an explored location, remove stage 2 from the quest deck, if able. If The Citadel has 11 or more damage, remove it from the game (do not collect its victory points). Response: After The Citadel leaves play as an explored location, remove stage 4 from the quest deck, if able. When Revealed: Place the top card of the underworld deck facedown underneath the active location, if able. Each location in the staging area gets +2 quest points. Forced: After Houses of the Dead becomes the active location, exhaust all characters. X is the number of players in the game. Response: When The Fourth Star leaves play as an explored location, each player may draw 1 card. Travel: The first player must take 1 hidden card to travel here. Western Road gets +5 quest points while it is in the staging area. Travel: The first player must take 1 hidden card to travel here. Easter Road gets +5 quest points while it is in the staging area. Travel: The first player must take 2 hidden cards to travel here. The current quest card gains Siege (and loses Battle). X is the number of players in the game. Travel: The first player must take 1 hidden card to travel here. Forced: At the end of the round, each player returns 1 enemy engaged with him to the staging area. 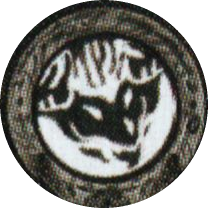 Shadow: If this attack destroys a character, place 1 progress token on To the Tower. X is the number of progress tokens on To the Tower. Immune to player card effects. While Iselet is the active location, each Dunland enemy in play gets +1 Threat. While Fords of Isen is in the staging area, players cannot gain resources from card effects. Forced: After Fords of Isen becomes the active location, each player with fewer than 5 cards in his hand draws cards until he has 5 in his hand. While any player has 3 or more cards in hand, The King's Road gets +3 quest points. While any player has 5 or more cards in hand, The King's Road gains: "When faced with the option to travel, the players must travel to The King's Road, if able." While Gap of Rohan is in the staging area, Dunland enemies get +1 Attack. Shadow: Attacking enemy gets +1 Attack. If this attack destroys a character, remove 1 time counter from the current quest. While Methedras is the active location, each location in the staging area gets +1 Threat. Forced: When Methedras leaves play as an explored location, each player Searches 3. Forced: After Orc Cave leaves play as an explored location, the first player Searches 5. Travel: Discard the top X cards of the encounter deck to travel here. X is the number of players in the game. Add each Orc enemy discarded this way to the staging area. Forced: At the beginning of the encounter phase, reveal the top card of each player's out-of-play deck. Add each revealed enemy to the staging area and discard the rest. Shadow: Defending player discards an attachment he controls. While Broken Lands is in the staging area, progress cannot be placed on locations in the staging area. Shadow: Attacking enemy gets +1 Attack for each location in the staging area. Dunland enemies get +1 Attack and +1 Defense. X is the number of resource tokens on this card. Forced: After a player draws any number of cards, place 1 resource token here. While Hills of Dunland is in the staging area, it gains: "Forced: After a player draws any number of cards, discard the top card of the encounter deck. If the discarded card is a Dunland enemy, put it into play engaged with that player. This ability does not stack with other copies of Hills of Dunland." Travel: Each player draws a card to travel here. Shadow: Attacking enemy gets +1 Attack (+3 Attack instead if undefended). X is the number of players in the game. While Grim Foothills is in the staging area, progress must be placed on Grim Foothills before it can be placed on the active location. Players cannot reduce their threat. While The Empty Mug is in the victory display, the current quest gains "Forced: After a player card effect reduces a player's threat, remove it from the game." Immune to player card effects. Cannot leave the staging area. The Crossing at Tharbad gets +2 quest points for each player in the game. When The Crossing at Tharbad is explored, the players win the game. Progress cannot be placed on Streets of Tharbad while it is in the staging area. While Streets of Tharbad is the active location, enemies get -20 engagement cost. While Tharbad Hideout is the active location, time counters cannot be removed from the current quest. Forced: At the beginning of the quest phase, place 1 progress on Tharbad Hideout. While Ruins of the Second Age is in the staging area, City locations get +1 Threat. While Ruins of the Second Age is the active location, deal engaged enemies 1 additional shadow card at the beginning of the combat phase. Travel: Search the encounter deck and discard pile for a Spy enemy and add it to the staging area. Shuffle the encounter deck. Shadow: Raise the defending player's threat by X, where X is the amount of damage dealt by this attack. Travel: Raise each player's threat by X to travel here. X is the number of enemies in play. Forced: After traveling to Hidden Alleyway, add 1 time counter to the current quest. While Decrepit Rooftops is the active location, enemies get +1 Threat and do not make engagement checks. Forced: After traveling to Decrepit Rooftops, return all engaged enemies to the staging area. Forced: After Ruined Plaza enters the staging area, place 1 damage here. Shadow: Defending player assigns X damage amoung characters he controls. X is the number of cards underneath The Orcs' Search. Scour: Return this location to the staging area and place 2 damage here. Shadow: Excess damage from this attack must be placed on the active location, if able. Scour: Assign X damage amoung locations in play. X is the number of locations in play. This ability does not stack with other copies of Ancient Foundation. Travel: Place 1 damage on this location to travel here. Forced: After placing any amount of progress here, trigger the topmost **Scour** effect in the discard pile, if able. Shadow: Attacking enemy gets +1 Attack. If this attack destroys a character, raise each player's threat by 1 for each card underneath The Orcs' Search. Immune to player card effects. Forced: After the last time counter is removed from this location, exhaust each damaged character. Place 3 time counters on this location. Forced: After the last time counter is removed from this location, starting with the first player, each player draws the top card of the Raven deck and puts it into play engaged with him. Forced: After the last time counter is removed from this location, reveal the top card of the Raven deck and add it to the staging area. Shadow: Deal attacking enemy 2 additional shadow cards from the Raven deck. Forced: After the last time counter is removed from this location, each player assigns X damage among characters he controls, where X is the number of cards in his hand. Forced: After the last time counter is removed from this location, each player raises his threat by the number of cards in his hand. Shadow: Defending player assigns X damage among characters he controls. X is the Time X value on the active location. While Borders of Bree-land is in the staging area it gains: "Forced: At the beginning of the quest phase, return 1 enemy engaged with a player to the staging area." Shadow: Defending character gets -1 Defense for each quest stage in play. While Outlying Homestead is in the staging area, players cannot reduce their threat. 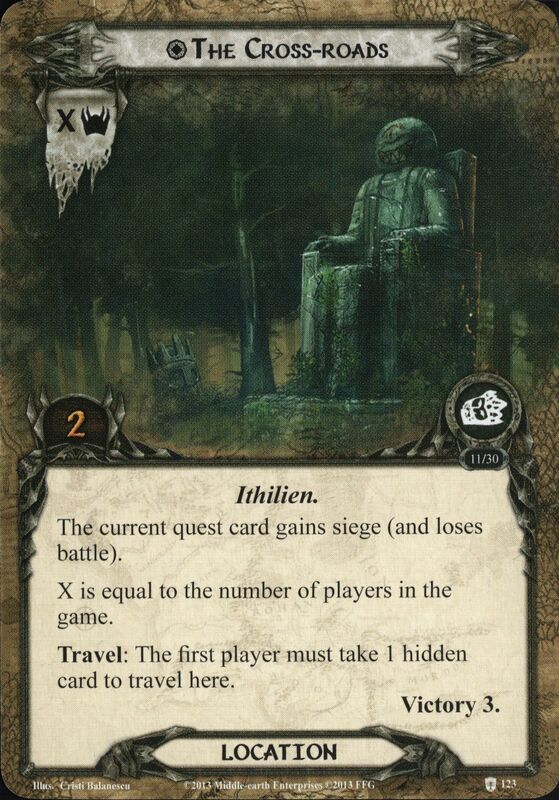 Travel: Reveal a card from the encounter deck. Immune to player card effects. While Amon Forn is the active location, it gains: "Forced: After an Orc enemy is added to the staging area, it makes an immediate attack against the first player." The players cannot win while Amon Forn is in play. Weathered Hilltop gets +1 Threat for each resource token on it. Forced: After a Weather treachery is revealed from the encounter deck, place 1 resource token here. While Concealed Orc-camp is the active location is gains: "Response: When Concealed Orc-camp is explored, place 1 resource token on the Mission objective." Travel: The first player searches the encounter deck and discard pile for an Orc enemy and put it into play engaged with him. Shuffle the encounter deck. Forced: After the last time counter is removed from Broken Battlements, each player discards the top 5 cards of his deck and places 1 time counter here. Travel: Each player discard the top card of his deck. While Norbury Tombs is the active location, it gains: "Respnse: When Norbury Tombs is explored, each player shuffles the top 5 cards of his discard pile into his deck." Travel: Return the topmost enemy in the encounter discard pile to the staging area. Fornost Square gets +1 Threat for each resource token on it. Forced: After the first player discards any number of cards from the top of his deck, place 1 resource token here. While Haunted Keep is the active location, the first Undead enemy revealed each round gains surge. Shadow: Defending player discards the top card of his deck. Attacking enemy gets +X Attack where X is the discarded card's printed cost. While Deadmen's Gate is the active location, it gains: "Forced: After a player triggers an 'Action' or 'Response' effect, he must discard the top card of his deck." If the current quest is a side quest, Rugged Country gets +2 Threat. Shadow: Attacking enemy gets +1 Attack for each quest card in play. X is the number of quest cards in play. While there is only 1 quest card in play, Shrouded Hills gains surge. Forced: After the "when revealed" effect of a treachery card is canceled, raise each player's threat by 2. Shadow: Attacking enemy gets +1 Attack. If this attack destroys a character, the defending player raises his threat by 2. Forced: When Ancient Causeway is explored, raise each player's threat by 2. While Eriador Wastes is in the staging area, no more than 5 progress can be placed on the current quest each round. Travel: The first player engages a Warg enemy in the staging area and deals it a shadow card. Immune to player card effects. Travel: The first player searches the encounter deck and discard pile for a Warg enemy, reveals it, and puts it into play engages with him. Shuffle the encounter deck. While it is Night, North Downs gets +2 Threat. While Accursed Battlefield is the active location, each quest card in play gains the battle keyword. Shadow: Attacking enemy gets +1 Attack (+3 Attack instead if the defending player's threat is higher than the attacking enemy's engagement cost). Forced: After an enemy attacks, heal 1 damage from it. Travel: Deal each enemy in play 1 shadow card to travel here. Shadow: If the attacking enemy is Thaurdir, heal 3 damage from him. While Fortress Walls is the active location, for each resource spent by a player, raise that player's threat by 1. Shadow: If your threat is 40 or higher, attacking enemy makes an additional attack against you after this one.